How can you be sure that you're teaching your children the lessons of virtue that were passed on to you? Today's parents often feel that they have too little time in their busy schedules to handle such an important task. They're not even sure where to begin. 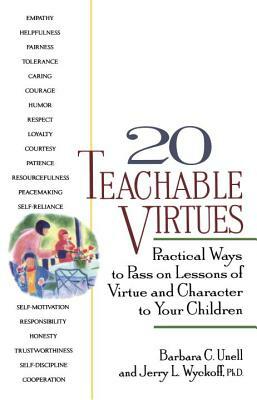 In 20 Teachable Virtues authors Barbara C. Unell and Jerry L. Wyckoff, Ph.D. demonstrate the simple ways that you can teach your children to care about others and about themselves. By using everyday time together, however brief, you can pass on the lessons of virtue that are most important to your familytoday and for generations to come. At a time when values seem to be on the decline and children are looking to their parents for guidance, this new book argues that the building of a more moral society begins in the home. Through numerous anecdotes and examples, Unell and Wyckoff show parents how a select group of 20 virtues can be instilled, and warn how easily kids can be sent the wrong message. "To learn to live in society," write the authors, "all children must learn to balance their personal wants against the needs of the social group (family, neighborhood, school, society). Today we see far too few examples of this kind of balance as people put their own wants and needs above all othersall of the time." Through the use of numerous anecdotes which illustrate each virtue, 20 Teachable Virtues shows how common occurrences can become "teachable moments".